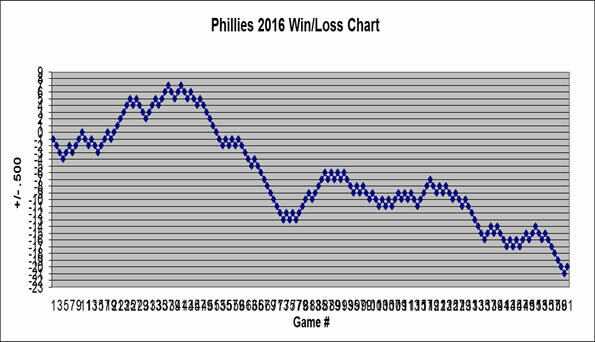 We have reached the one-third mark of the Phillies season, so it is projection time. After watching 57 innings and 17 hours, 19 minutes of grueling Phillies and Mets action, I don’t have the energy to provide any commentary whatsoever here. After 17+ hours of pitching coaches creating dirt paths to the mound, Mets catchers conversing with pitchers, and one middle reliever after another put up zeros against inept offenses, I am here for no other reason than provide the sad numbers. At the current rate at the one-third mark, they will finish with the third worst pitching staff and 10th ranked offense in runs scored. You can see more of the team totals and rankings from before yesterday’s game (and technically one game before the one-third mark) right here. The Phillies are on pace to lose 90 games with the fifth worst record in baseball and third worst in the National League, 18 games out of first, 12 games behind the wild card leader, and 6 games from second-to-last place. As for the individual projections, here are the prorated numbers of the hitters, starters, and relievers if we multiply everything by three.